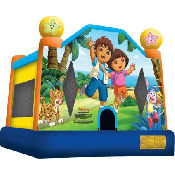 Dora & Diego Bouncer - Bounce House & Party Rentals | Inflatable-Kingdom.com Jackson MS.
Planning a Dora the Explorer themed party for your little ones birthday? Well rest assured this Dora themed bouncer is perfect entertainment for your smaller children. This moonwalk features a beautiful picture of Dora and Diego. The space jump is perfect for kids to jump alongside friends all day! This bounce house is the perfect way to combine fun and a healthy activity. Children enter and exit via an entrance ramp encourages kids to enter one by one. Also, our 360-degree mesh windows allow parents and guest an awesome view of children jumping in a safe and clean environment. This makes for some awesome photo opportunities. Go ahead and add this awesome space jump to your cart. This bouncer rents often and very quickly.